Community and independent ski areas rely on the families that ski there and the communities they serve. Unlike mega-resorts, their mission is fueled by providing a great service, not by corporate profits. That’s why we believe that community and independent ski areas are better for our mountains, our communities and our world. But, community and independent ski areas do more than provide great snow riding at a price that families can afford. They also give back to their communities and work harder to protect their mountain environments, and our world. Here are just a few of the great community and independent ski areas that are making our communities and our world a better place. Mt Timothy is a family oriented, community ski area in British Columbia. Mt Timothy relies on community support and they give it back in return. Not only do they provide a great community resource for snow sports, they also support the community with events like Support Your Local Food Bank Day. On February 26th, Mt Timothy will discount lift tickets 50% to all skiers and riders that bring a nonperishable food item. With lift tickets that are already a third of the cost of many mega resorts, this is the kind of community involvement that sets community ski areas apart. Smuggler’s Notch is known as America’s Family Resort and has repeatedly won awards and been voted America’s top family and kid’s ski area. It’s more than a great ski school and year round family activities that keep families coming back to Smuggs. Their commitment to families and community shines through in the support that they give to community organizations. The Molly Fund Rail Jam is an event in it’s 5th year at Smuggs. The Molly Fund supports the Dana Farber Cancer Institute at Children’s Hospital – Boston. The Molly Fund Rail Jam is Saturday, March 11th and begins with registration at the Yurt in parking lot 1 at 9am. The event features music, giveaways, raffles and of course some awesome riding. Molly’s battle with cancer sparked the love of a community and thousands of people rallied behind Molly, as well as our family, and the love continues to flourish with The Molly Fund. Molly has taught us many things throughout this journey. We understand too well how very precious life is and we have come to redefine the priorities in all of our lives. Suddenly, we are able to find more time to spend with our families. We hug each other more tightly, kiss each other more passionately, and we’re focused on being better parents….better people. Molly’s fight has also taught us the importance of helping others. We have been blessed with an incredible amount of support, from friends, family, and strangers alike, and it’s clear to us now that Molly’s legacy – the Molly Fund – will continue to help other families endure the financial strain while they are helping their child battle cancer. Another independent ski area fighting cancer is Mt Hood Skibowl. 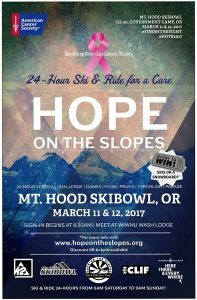 They are one of several locations of this year’s Hope on the Slopes Ski and Ride for a Cure. The fundraiser for the American Cancer Society uses friendly competition to encourage skiers and riders to raise money and ski or ride as many vertical feet as they can in 24 hours towards their goals. 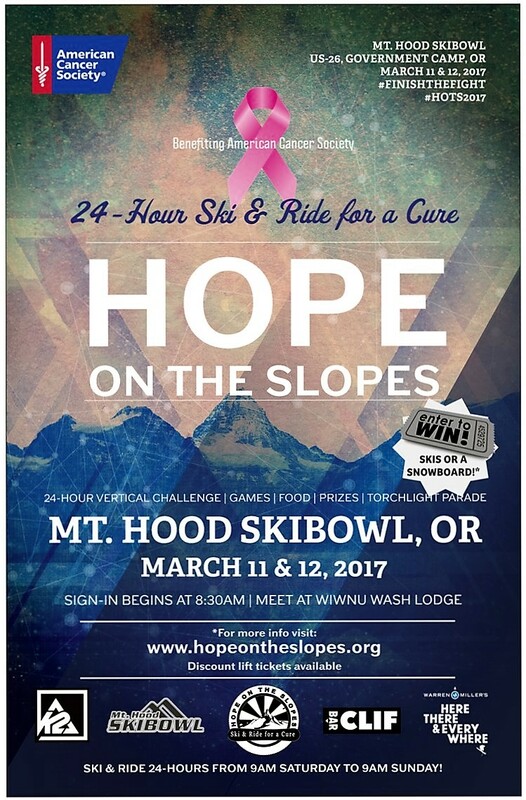 The Mt Hood Skibowl event is one of two 24 hour events and with the most night skiing in North America, participants are sure to have a great night raising money to “Finish the Fight”! The event begins Saturday March 11th at 8am with vertical tracking beginning at 10am and continuing until 10 am Sunday morning. Not only are they working for the members of their communities, small ski areas like Mt Baker are also working hard locally to make a difference globally. On March 4th and 5th Mt Baker will be hosting “The Future of Ice”, a University of Washington initiative to further knowledge about the polar regions and the environmental, economic and political pressures that these regions face. The event is a two day discussion on global climate matters and the successful efforts of the Pacific Northwest advancing toward solutions. Mt Baker’s willingness to host The Future of Ice and open the conversation between their mountain community and the scientists and experts on global climate shows that sometimes there are more important issues than the bottom line. Read more about Mt Baker hosting the Future of Ice series. The “Future of Ice” Initiative represents a commitment by the University of Washington to invest in knowledge about the polar regions. Future of Ice also provides a framework through which to foster collaborative partnerships with stakeholders in the polar regions, where the triple challenges of climate change, new economic pressures, and rapid social and political disruption intersect. Mountain Rider’s Alliance has been a friend of the small, independent and community ski areas since 2010. In furthering their goals of supporting the soul of skiing, MRA will hold the 1st Annual Summer ShredFest hosted by Beartooth Basin. The ShredFest is an end of season party with a purpose. Ski industry veteran Jon Reveal will deliver the event’s keynote speech with a compelling look at the state of small ski areas. There are many reasons that the MRA is so intent on seeing community and independent ski areas survive. One of them is that community ski areas are so important to the communities they serve. Community ski areas do more to promote responsible use of their mountain environments. Independent areas do more to support the communities and families that they serve. The little places do more to protect our communities, our Winter sports and our World.